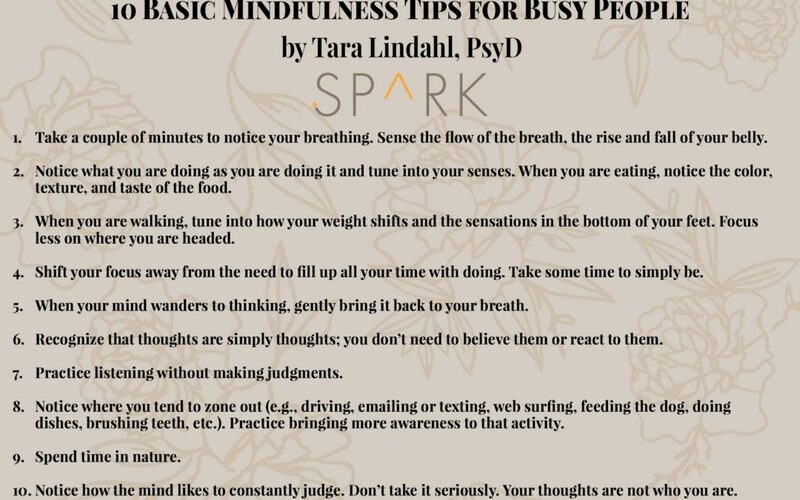 You may have noticed how mindfulness comes up often in today’s age—sometimes in ways that, unfortunately, make it seem like more of a buzzword than a building block for mental health. According to Jon Kabat-Zinn in his national best-selling book, Wherever You Go, There You Are, “Mindfulness means paying attention in a particular way: on purpose, in the present moment, and nonjudgmentally.” Effectively, mindfulness is being aware of what you are doing while you are doing it, and it is at the heart of responding thoughtfully and skillfully to the thoughts, feelings, and other experiences we have throughout our day-to-day lives. Take a couple of minutes to notice your breathing. Sense the flow of the breath, the rise and fall of your belly. Notice what you are doing as you are doing it and tune into your senses. When you are eating, notice the color, texture, and taste of the food. When you are walking, tune into how your weight shifts and the sensations in the bottom of your feet. Focus less on where you are headed. Shift your focus away from the need to fill up all your time with doing. Take some time to simply be. When your mind wanders to thinking, gently bring it back to your breath. Recognize that thoughts are simply thoughts; you don’t need to believe them or react to them. Practice listening without making judgments. Notice where you tend to zone out (e.g., driving, emailing or texting, web surfing, feeding the dog, doing dishes, brushing teeth, etc.). Practice bringing more awareness to that activity. Notice how the mind likes to constantly judge. Don’t take it seriously. Your thoughts are not who you are.